Welcome to Day 3 of Fresh Tasty Valentines where about 20 bloggers are getting together to present you with creative and healthy recipes and several sponsors have provided products for many giveaways! Today I am featuring Herbed Egg Muffins on Mixed Greens, which includes ingredients from two of our sponsors, Gourmet Garden and Bob's Red Mill. Gourmet Garden sent me an amazing package with several of their stir-in pastes and lightly dried herbs, and Bob's Red Mill was generous enough to send me some of the hulled hemp seed hearts. I've mentioned in previous posts that I'm notorious for running late in the morning and not eating breakfast. If I'm running out of the house, I'll only eat breakfast if I can grab it and go. One of the things that I like to do is make egg muffins. They keep for a couple days AND you can freeze them, so you can thaw them overnight or nuke them in the microwave. For this recipe, I decided to highlight the herbs and the hemp seed hearts so I kept the recipe very simple. I only used herbs and a light mozzarella cheese to mix in the eggs, then I topped them with the hemp seed hearts. Then I also decided to serve these on top of mixed greens drizzled lightly with olive oil and topped with sea salt flakes and some more hemp seed hearts. The prep takes only minutes, then you pour them into a muffin tin to bake. This is such an easy and filling recipe to make! And, how I like many of my recipes, it's very versatile. Play with the different types of herbs that you like, change up the cheeses, and toss in a couple of your favorite ingredients! And if you're someone on-the-go, this is a perfect recipe to prepare ahead of time and then grab it and go in the morning! Now, Gourmet Garden and Bob's Red Mill have contributed to our giveaway! Gourmet Garden is providing two gourmet garden coolers filled with herb pastes and lightly dried herbs to one winner. Bob's Red Mills is also providing a package of hulled hemp seed hearts to one winner. Please see the entry form below to enter to win both of the giveaways and to also enter to win one of the numerous other prized provided by our generous sponsors! To find out more about Gourmet Garden, please visit their website or social networks (Twitter, Facebook, Pinterest, Instagram, Google+)! To find out more about Bob's Red Mill, please visit their website or social networks (Twitter, Facebook,Pinterest, Instagram)! This post was sponsored by Gourmet Garden and Bob's Red Mill. While I was provided free product, I was not compensated for this post and, as always, the opinions and the recipe of this post are all my own. Preheat oven to 350. Lightly spray a standard 12-cup muffin tin with nonstick cooking spray. In a large bowl, whisk together the eggs, egg whites, salt and pepper. Add in the herbs and mozzarella, then mix well. Place about 1/4 c. of the egg mixture into each of the 12 muffin cups. Bake for 20-25 minutes or until the eggs are set. When ready to serve, mix greens lightly with a good quality olive oil (you only need a couple drizzles) and sprinkle with flaked sea salt (use this according to taste). Plate 1 cup of the mixed greens on a plate, then top with two egg muffins, and sprinkle with more hulled hemp seed heats. Note: Egg muffins can be refrigerated for about 3 days or can be frozen in an airtight container for up to three months. 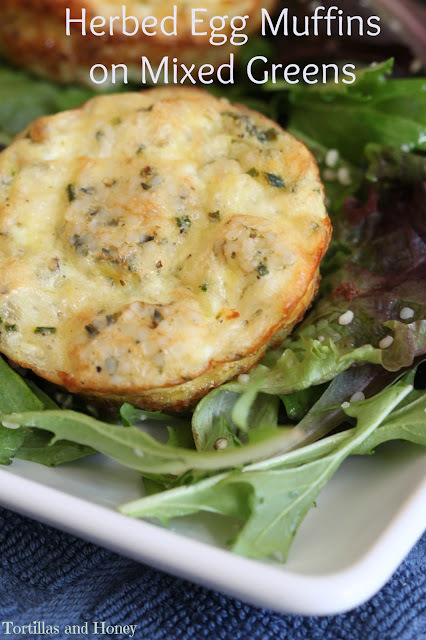 While I would never have thought of putting an egg muffin on top of a salad before, it now is something I would most definitely love to try! These little egg muffins are the perfect take along breakfast on busy mornings. Renee, this looks fabulous! What a great idea. I would never have thought to use the hemp seeds that way. So smart. I would love to make a ton of these and freeze them for easy breakfasts. Glad that I found this post! Planning couple of corporate events Chicago and will try some of these wonderful recipes. Thanks for sharing my friend as was looking for something unique to serve in the menu.